Many, many years ago in a little far away country lived a girl who oftenly went to movie with her daddy to watch movies about wild, wild west. In these movies she saw wonderful bed blankets made from many colorful small pieces of fabrics. And of course, she wanted to have one, but in her far, far away country no one knows how to make it. Then, some decades later clever men invented internet and our little girl (being granny in meantime) finally learned how to make a quilt. From many scraps , in all the wonderful colours in the world. Znam da pisanje bloga već odavno nije "in" ali sve više osjećam potrebu da se vratim ovom formatu i sad sam tu. U mom malom svijetu se i dalje ne događa ništa spektalurano, živim tempom koji mi odgovara, mirno i s da će najmanjom mogućom količinom stresa, svjesno izbjegavajući negativne događaje i osobe. Možda to i jest zabijanje glave u pijesak ,ali odavno znam da ne mogu mijenjati svijet već samo sebe.Kada sam prije osam godina otišla živjeti na selo ,znatan je broj osoba, iz moje okoline uključujući i neke vrko bliske, bio vrlo skeptičan i gotovo nitko nije vjerovao da će moja country faza potrajati. A ja sam i dalje tu, uvijek i nadam se zauvijek. Neću previše mudrovati ni pokušati ikoga nagovoriti da odabere moj način života, ali odluka o dolasku ovamo je vjerojatno najbolja koju sam ikada donijela. 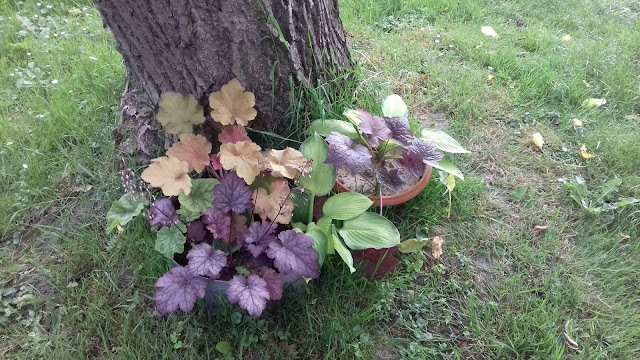 I dalje se ne bavim poljoprivredom, ove sam godine odustala i od povrtnjaka, jedino mi ostaje moje cvijeće i to prvenstveno hoste kojima su se pridružile heuchere, hemerocalisi i dalije. Nažalost zbog dugotrajne suše i ekstremnih vrućina ne mogu se jako praviti važna, sada mi je jedino važno da što više biljaka preživi iduće ćemo godine uživati u njihovoj ljepoti. I think I'm now officialy qualified for this year Bonnie Hunter's mistery quilt. My Grand illusion is a flimsy with real chance to be quilted before new Mistery. I did make some changes: didn't like that blue so I took gray instead, made it narrower for one row and also substituted pieced borders with narrow yellow and simple black border. i wasn't delighted workig on this quilt, but now I realy, realy like it. It is going to be a both Christmas and birthday gift to my sister, and a big surprise I believe. She likes this quilt a lot but I lied to her telling it is for someone else. 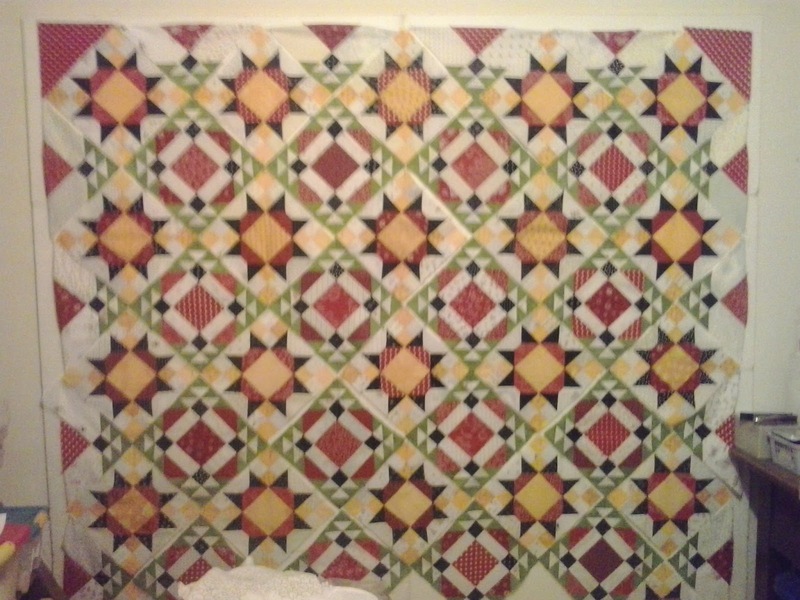 This year I've decided to finally make Bonnie Hunter's Mistery quilt together with thousands other quilters. I prepared myself properly, even got paint chips cards from FC friend ( thank you Sandy), but.... Yes there is always a big BUT. These year it is my daughter's wedding on December the 13th, so I have very little time to play along. I've cut all yellow and black squares and some more pink/blue HST and sew only these six together. I'm not quite satisfied how they look , the yellow seems to dark for me, I think to substite it with lighter ones. In meantime I have to finish quilting on this Christmas table topper before leaving to wedding next week. What was I doing on Friday evening? Sewing with my online friends, of course. But this Friday I was not sewing, I was quilting. And was very efficient, I've finished this baby quilt, only have to bind it. Here is finished quilt - blue version. They are going to be a present to little Sara and her brother David. Less then a month until Easter, time to make new decoration. I've seen these chicks on so many different places and just have to make them. After Easter they would move to my sewing space and become pincushions. Temperatures are low and snow is still enough high to enjoy staying in house and working with needle. So let's see what I did. I actually didn't make any new flower, but I think puting them together could be counted. This is going to be a table topper for the round table I have, not quilte sure how big it would be. Easter is not far away so I stitched this little wall hanging for the kitchen.I would probably add some embelishing; old buttons or pieces of lace before quilting, have two months to finish it. But Valentine is just around the corner and I have to finally decide what to do with these cute little hearts I made few years ago. I was thinking of another wall haning or table runner by adding red fabrics, what do you think? And last but not least the first finish of this year. This little quilt needed two years from UFO to FF. I'm back with my scrapy flowers; I've miscalculated needed flowers and HOPE these are the last two. I couldn't resist to picture them in the snow, aren't they lovely. Yes, winter came in all his beauty with enough snow to enjoy in it and without major problems yet. 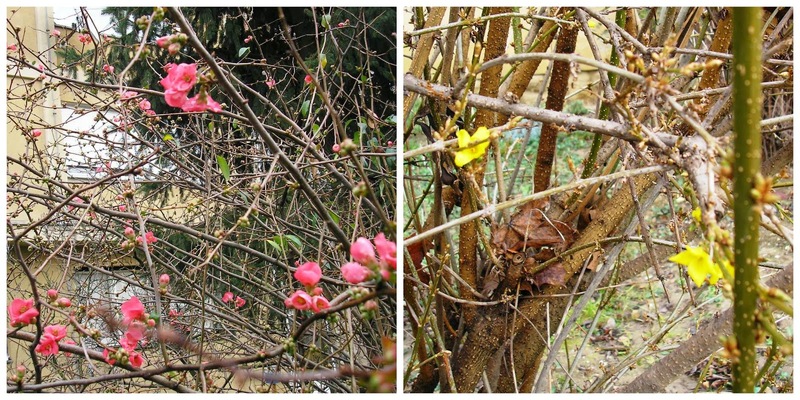 Could you believe that these pics were taken just a week ago? So far we had very strange winter , but now everything is just it has to be. Somehow I forgot to show you pictures of my Christmas quilts. They are all made with same block - Under the mistletoe, look what a different layout could do. Fabrics are pretty much the same : reds, greens and neutrals with gold.